Lifetime Skills Academy (LSA) mission is to develop future leaders ready for our new technological world. Our programs are designed to ensure that students get a full range of exposure to all the new technologies, and the soft skills such as Leadership and confidence speaking publically to thrive in the world. We create a positive environment full of support and motivation. Our systems are developed by the top experts in Technology and Psychology, and all of our coaches are certified. 5 Star Development System: The 5 Star Development System gives students 5 measurable levels with specific criteria to achieve. This helps our students with their motivation, knowledge, and development in each sport they are learning. Student Tracking System: The students are assessed in a thorough manner to ensure they are placed in the right level of the development system. They are consistently tracked from program to program and re-assessed with frequent progress reports at the end of each program. Complete Program Support System: LSA offers a complete range of programs to ensure that every student is getting the exposure and skills they require in their stage of development. Top Quality Instructors: LSA has a rigorous coaching assessment system and hires only the best instructors. Each instructor has their vulnerable sector police check and significant experience. Dedicated Directors Education Field: The Directors of LSA have degrees in Technology and Software coding. They have significant experience in the industry and are connected with all the developments in exponential technology. With specialized instruction, low student-to-coach ratios and an encouraging learning environment, every student will get the level of attention required to improve their knowledge. 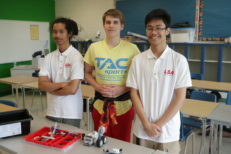 LSA programs develop real leaders and show the children how fun learning about new technologies can be. They learn about themselves and their unique gifts and abilities. Instructors take the time to explain, motivate and help each student coming through our program. Each instructor is highly trained with a great deal of experience in their chosen field.